147 min. Walt Disney Pictures. Directors: Anthony Russo, Joe Russo. Cast: Chris Evans, Robert Downey Jr., Scarlett Johansson, Sebastian Stan, Anthony Mackie, Don Cheadle, Jeremy Renner, Chadwick Boseman, Paul Bettany, Elizabeth Olsen, Paul Rudd, Emily VanCamp, Tom Holland, Frank Grillo, William Hurt, Daniel Brühl, Martin Freeman, John Slattery, Hope Davis, Marisa Tomei, Alfre Woodard. When it comes to superhero culture, can there be too much of a good thing? That's the conundrum facing the purveyors of the shared-universe paradigm: early adopter Marvel and Johnny-come-lately DC. Marvel Studios' unprecedented plan, in cahoots with Disney—and generally enthusiastic reception from fans and critics alike—reaches a new zenith with Captain America: Civil War. It's possible that, with this film, palpably more satisfying than the heavily hyped Avengers films that preceded it, Marvel has stepped up to a symbolic line not so different from the one drawn in front of Cap and his allies in Civil War...this far and no further. After all, here we have a superhero movie that gathers no fewer than fifteen heroes and villains in roles that amount to considerably more than cameos. They populate a sprawling story with marching orders to serve as a direct sequel to Captain America: The Winter Soldier (and resolving the can of worms that film opened concerning Cap's sidekick-turned-"Manchurian Candidate" super-soldier "Bucky" Barnes), a crazy-cool superhero team-up/smackdown movie to make Batman v Superman: Dawn of Justice look like a tea party, and a franchise-launching introduction to the new Spider-Man (teenage Tom Holland). Seemingly, it's everything a comic-book junkie would expect from a single Marvel movie, and more, for the price of a single ticket. I mean, it took Twilight, The Hunger Games and Divergent two movies each to tell their culminative stories, and they were all dull as dishwater. Now, for around nine bucks, you get a James Bondian film-opening action sequence times four (heroes), a centerpiece six-on-six clash of the superheroic titans, and a twist-y this-time-its-personal fight climax, along with enough quips to get you double-checking the credits for a Joss Whedon assist (nope: all screenwriting credit goes to Christopher Markus & Stephen McFeely). This is what one calls "an incredibly high degree of difficulty," and the writers join directors Anthony and Joe Russo in sticking the landing. Non-comic-book-geeks may struggle to keep up with the storyline, and the frantic-ness of the action (especially in 3D) may prompt some to lapse into diabetic comas, but those people will be the one-percenters of this movie's guaranteed-to-be-massive global audience. I haven't forgotten to tell you what the film is about, although does it matter? As in Batman v Superman, questions of collateral damage (as Avengers "routinely ignore sovereign borders") plague our heroes, prompting U.S. Secretary of State Thaddeus "Thunderbolt" Ross (William Hurt) to show up at Avengers HQ and intone, "The world owes the Avengers an unparalleled debt." Yeah, there's a "but" coming: the United Nations has drafted a superhero-control act dubbed the Sokovia Accords, set to be ratified by 117 countries, and Ross would like the Avengers to sign it, thank you very much. And there's the sticking point of this Civil War: Steve "Captain America" Rogers (Chris Evans) doesn't trust nations to set agendas when the stakes remain so high, while Tony "Iron Man" Stark (Robert Downey, Jr.) feels it's time to eat a little crow, pay a little penance, and earn back some trust. Heroes old and new line up with Team Cap (Sebastian Stan's Bucky, Anthony Mackie's the Falcon, Elizabeth Olsen's Scarlet Witch, Jeremy Renner's Hawkeye, and Paul Rudd's Ant-Man) or Team Iron Man (Spidey, Scarlett Johansson's Black Widow, Boseman Chadwick's badass moralist Black Panther, Don Cheadle's War Machine, and Paul Bettany's the Vision). It's just the discord mysterious baddie Helmut Zemo (Daniel Brühl) wants, "to see an empire fall." And it's just what a modern movie audience craves: prime action-adventure fare. Markus and McFeely serve the extraordinary number of characters with their impressive construct, and the movie pays forward, many times over, the team-up thrills initiated by The Avengers and nudged along by its sequel and Batman v Superman. This is a Captain America movie that builds to the Tom Joad-esque promise "If you need me, I'll be there" while pausing to allow Iron Man to groom Spidey and put him to the test. It matters not to my not-so-inner child that Civil War has new players but few genuinely new themes or tricks. Says he: yes, please. But enjoy the bargain-value ticket price now: Marvel's hatching plans for its own two-part extravaganza (Avengers: Infinity War—Part 1 and 2) to prove there's no such thing as too much or too far, especially when it comes to box office. 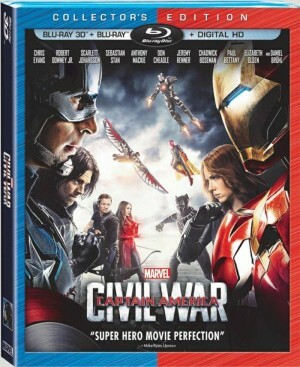 Disney sends Captain America: Civil War home in a Blu-ray 3D + Blu-ray + Digital HD special edition with reference-quality A/V and a battery of pleasing bonus features. The 3D image is plenty spectacular. Even in the dark prologue, the transfer immediately produces a sense of depth, as when an arm extends toward a keypad deeper in the frame. In quiet moments, the 3D comes in the form of a ViewMaster-style effect of characters and objects placed on differing planes of depth, such as when prison bars or mesh separate captives and their freedom. Supertitles, readouts, falling snow, and reflective surfaces lend themselves to 3D plus-ing, as of course does the high-flying vertiginous action. Freefalling bodies excitingly define depth, and the 3D version uses popout effects sparingly enough to give them good impact, as is the case with flying debris and shattered glass coming at the viewer, Cap reflexively swinging his shield back through the frame and seemingly into the viewer's space, and Iron Man's projectiles in the climactic fight. Naturally, the biggest 3D excitement comes in the seventeen-minute IMAX sequence, for which the aspect ratio expands to fill the screen at 1:85:1: particularly the clashes of Spidey and Cap, and Spidey vs. Bucky and the Falcon. The only complaint is that the 3D image feels at times a touch dimmer than perhaps it should (I only noticed crosstalk being a minor issue for the subtitles for the deaf or hard-of-hearing: the picture itself never was troubled by crosstalk on my display). The 2D transfer is likewise terrific and a nice option for those times when 3D might be a bit much for the brain or eyeballs. Tightly defined and thus sharply detailed, the colorful image never struggles to keep up with the kinetic action. Contrast is well-calibrated and deep blacks anchor an image with perfect contrast. This transfer, too, opens up from its usual 2.39:1 aspect ration to 1.85:1 for the best-in-show 17-minute IMAX sequence (this was the first movie to film with the IMAX/Arri 2D camera). Though the theatrical exhibition could be enjoyed in Atmos, the home-video presentation is in DTS-HD Master Audio 7.1. Never fear: this is a blisteringly powerful action mix also capable of subtlety and clarity in dialogue, the thunderous music, and effects. Placement is top notch, and immersion is such that, for the first time in my home theater, I actually jumped in my seat—due to a well-placed door clang in the right rear speaker. The Blu-ray disc auto-plays three Sneak Peeks also available from the main menu: a Dr. Strange teaser trailer (2:03, HD); an Audi behind-the-scenes promo/advertisement (2:10, HD) directors Joe and Anthony Russo, stunt coordinator Sam Hargrave, co-producer Mitchell Bell, Sebastian Stan, stunt coordinator Andy Gill, Chris Evans; and an ad for the game Marvel: Contest of Champions (:32, HD). A feature-length audio commentary with Anthony & Joe Russo and Christopher Markus & Stephen McFeely finds the fantastic four discussing the project from early development to completion, most intriguingly touching on abandoned script ideas. Featurettes will probably be the first stop for Marvel fans, and they won't be disappointed. "United We Stand, Divided We Fall—The Making of Captain America: Civil War, Part 1" (22:25, HD) gathers directors Joe and Anthony Russo, producer Kevin Feige, Evans, Robert Downey Jr., Marvel Studios co-president Louis D'Esposito, writers Stephen McFeely & Christopher Markus, Anthony Mackie, executive producer Nate Moore, fight coordinator James Young, Stan, visual effects supervisor Dan DeLeeuw, Hargrave, Frank Grillo, Elizabeth Olsen, Jeremy Renner, prop master Russell Bobbitt, Paul Rudd, Scarlett Johansson, William Hurt, Don Cheadle, and head of visual development Ryan Meinerding to begin discussing the production, stunts, concept, story, themes, and characters, especially in the sides they take. "United We Stand, Divided We Fall—The Making of Captain America: Civil War, Part 2" (23:18, HD) completes the discussionby adding Paul Bettany, executive producer Victoria Alonso, Chadwick Boseman, Tom Holland, and Daniel Brühl. A wealth of production B-roll footage, as well as film clips, gives us exciting access to the set. "Captain America: The Road to Civil War" (4:11, HD) and "Iron Man: The Road to Civil War" (4:27, HD) use clips and talking heads to recap and comment on each character's journey to and through Civil War; they're promos, but surprisingly meaty despite the compact run times. "Open Your Mind: Marvel's Doctor Strange—Exclusive Sneak Peek" (4:02, HD) unveils new footage and interview clips of Feige, Benedict Cumberbatch, director Scott Derrickson, executive producer Stephen Broussard, Chiwetel Ejiofor, Tilda Swinton, Benedict Wong, and Mads Mikkelsen. Four interesting-enough "Deleted & Extended Scenes" (7:52 with "Play All" option, HD) comprise "Extended Peggy's Funeral" (5:57, HD), "Zemo Meets Doctor Broussard" (:33, HD), "'You Are Not Used to the Truth'" (:52, HD), and "'Gotta Get Me One of Those'" (:29, HD), the last with unfinished effects, and rounding out the bonus features is the film's "Gag Reel" (2:53, HD). Thanks to Disney and Marvel, here's the Blu-ray release of the year for superhero junkies of the home-theater variety. All site content © 2000-2019 Peter Canavese. Page generated at 04/17/2019 05:50:09PM.